“This Tour is AMAZING!! That is all. Carry on.” That is a direct quote on Facebook from the band Thy Will Be Done posted the night before their show in Lincoln, NE, on November 13th. That pretty much summed up the night as well. Trivium, DevilDriver, After The Burial, and Thy Will Be Done had a tour stop at The Bourbon Theatre. From the first song of the night to Trivium’s last, the show did not disappoint at any time. During the night, Backstage Entertainment got a chance to interview all four bands to talk about the tour, what’s coming up for each band, their new music, and more. First, we had Mike from DevilDriver and he talked about the new album, “Winter Kills,” how fans have told him he looks like Corey Taylor, and how the band’s fame affects them in public. 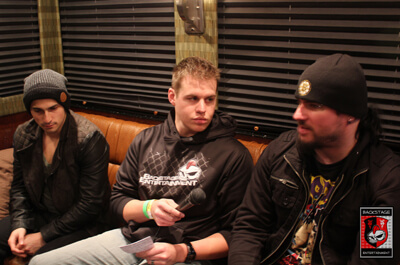 After sitting down with Mike, we walked a block from The Bourbon to Trivium’s bus where we sat down with Paolo and Corey in our second interview of the night. These guys had a lot of fun with the “BSE Box” and answering fan questions as well as talking about the new album, “Vengeance Falls,” which is out now. Heading back to The Bourbon, we went downstairs for our next two interviews. Meeting with J. Costa and Kurt from Thy Will Be Done, this interview brought out the impressions as well as talk of their album, “Temple.” Then Lee from After The Burial as well as the band’s buddy, Chris, sat down with us in our final interview of the night. As the interview went on more band members joined in and we all had fun with the fan submitted questions and actions. After The Burial is really excited for their album, “Wolves Within,” to be released on December 17th, which was a topic of discussion in the interview as well. Make sure to check out the links below to watch the interviews and see the photos from the night.